Foxes average weight is about 10kgs and the female Fox is 8kgs. The colour of the Fox’s fur varies and can range from yellowy orange, through red to black. Most common characteristic of the fox is white fur on the chin, chest and end of the tail. Breeding season lasts for three months over the winter period. Foxes gestation period is about eight weeks. Litter sizes range from one to ten ‘kits’. ‘Kits’ leave their Mother at between 6 and 8 months old. Although a fox could live well beyond 10 their life expectancy in the wild is short and probably only averages between one and two years. Foxes tend to make their homes in woodland and farmland.Except for breeding females foxes do not tend to sleep in their ‘dens’ but may sleep in the open. Foxes are nocturnal creatures but do occasionally venture out in daylight. 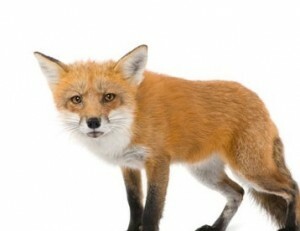 Foxes are curious animals but also wary of contact and are unlikely to approach a human and have seldom been known to attack fully grown domestic pets such as dogs and cats. The foxes diet is variable – whilst they are omnivores and eat chickens, rats, mice etc they also like berries, fruit, vegetable and grains. Foxes will, in fact, eat pretty much the same as a human being which is why they scavenge in dustbins.